Ortho• Iron contains a superior form of iron shown to be much easier to tolerate that other forms of iron. SunActive® iron contains ferric pyrophosphate that has been processed to reduce the particle size because smaller molecules have higher absorption rates, but that are also bound to a food grade emulsifier to prevent clustering, giving it a bioavailability equal to that of pharmaceutical-grade iron prescriptions. The other nutrients found in the formula support iron absorption and utilization and prevent the oxidative effect associated with iron supplementation. Primary Uses: Ortho• Iron is a complete formula for the treatment of iron deficiency anemia. Iron-deficiency, which can lead to anemia, is the most common nutritional disorder in the world with approximately 25% of the world's population being iron-deficient. However, even iron-deficiency states that do not lead to anemia may have detrimental effects on human health, including compromised cognitive function, overall weakness and fatigue, and a weakening of the immune system. Pregnant and menstruating women are often at risk of iron deficiency, as are adolescents, endurance athletes, and anyone undergoing a condition of growth and/or fatigue or who has experienced blood loss. 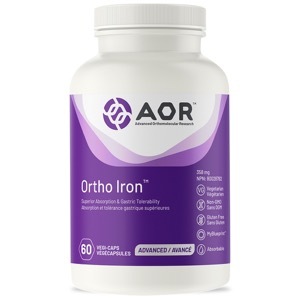 Ortho• Iron is the most advanced iron supplement for those with an iron deficiency and is especially helpful for those who suffer from constipation associated with iron supplements, who have been prescribed conventional iron pills or who have had uncomfortable side effects from conventional iron pills. • Anemia can result from folate or B12 deficiencies since they are required to produce red blood cells. • Vitamin C enhances iron absorption and red blood cell production. • Vitamin B6 in the form of pyridoxal-5-phosphate supports hemoglobin production. • Copper converts iron into the form used in hemoglobin; without it, iron can build up in the body, becoming toxic. The Linus Pauling Institute states that “One of the most common clinical signs of copper deficiency is an anemia”. • Lactoferrin is an iron transporter than enhances iron absorption and protects against any negative side effects associated with iron supplementation. Take1 capsule daily with food, or as directed by a qualified health care practitioner. Anderson GJ. Control of iron absorption. J Gastroenterol Hepatol. 1996; 11:1030-1032. Beard JL. Iron requirements in adolescent females. J Nutr. 2000; 130(2S Suppl):440S-442S. Kurz KM, Galloway R. Improving adolescent iron status before childbearing. J Nutr. 2000; 130:(2S Suppl):437S-439S. Oski FA. Iron deficiency in infancy and childhood. N Engl J Med. 1993; 329:190-193. Wessling-Resnick M. Iron transport. Annu Rev Nutr. 2000; 20:120-151.